Richard Widmark found yoga weighing in at over 650 pounds. Since then, he fell in love with yoga, then "hated" yoga, then again loved it so much that he has decided to become a yoga teacher. 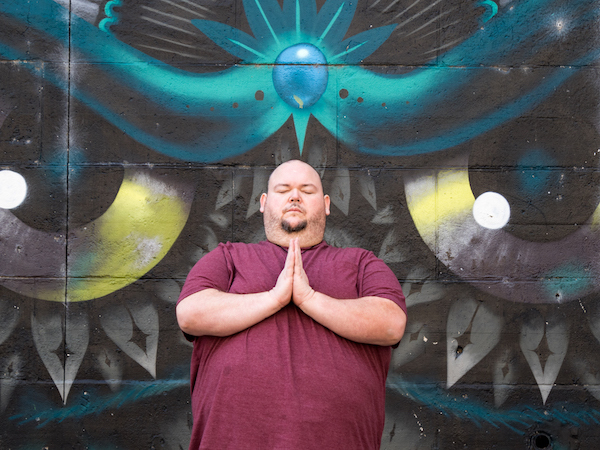 He's lost over 150 pounds since discovering the power of yoga, and hopes to one day teach yoga to anyone willing to give it a try. He's battled depression his whole life along with an eating disorder. Yoga has helped save his life and now he wants to give that life to others so they can be helped too. What Do You Love Most About Yoga? I love how I feel in Savasana. Once I get there, I know I've done the work and now it's time to meditate. Meditation for me has taken on a new meaning since finding Integral Yoga. It's helped me find inner peace and a deeper connection to that higher energy. It's brought me many opportunities to grow physically, mentally, and spiritually. How Has Yoga Changed Your Life, Personality And Physique? Yoga has taken me on an interesting journey since I started practicing in February of 2015. When I first started, I was looking for something more than a workout. I was looking for something deeper than just moving my body. I needed to get out of my mind and it did that. Then, due to something personal, I decided I needed to step away from yoga. I began to hate everything yoga stood for. But really what happened wasn't me hating yoga, it was me disliking the situation I put myself in that forced me to leave my practice behind. Then one day last year (2016), I decided it was time to go back and give it a try. I had finally forgiven myself for walking away, and now I love it again...most days, haha! Yoga is teaching me that it is okay to be exactly where I am at with life, it's still an every day struggle, but I cope with things better than I once did. I use to hold everything in and just wait to explode, now I'm more open to say what's in my heart. Physically, yoga has allowed me to gain strength and flexibility along with weight training. I have also decided that I want to become a yoga teacher! I started my RYT 200 training in January '17! What Everyday Things Did You Get Better At Because Of Yoga? I walk around with a greater sense of inner peace. How Do You Keep Your Yoga Practice Interesting And Challenging? Hmm...I'm not really sure how to answer this one, but what I can say is that I just continue to show up to classes and let whatever happens, happen. Honestly, I haven't needed a reason to spice up my practice, but I'm always open to try new things. What Book, Website Or Person Inspires You? Krishna Das. I went to his retreat at Yogaville this year and I was just blown away by him. For him to be so open with his struggles, and willing to share and teach, inspires me to keep doing what I'm doing in life. Which Yoga Pose Challenges You the Most? Which day of the week are we talking about? Haha!! I think the biggest challenge isn't in the poses—it's in my mind. Some days I forget the body that I'm in and my limited capabilities. I see someone doing a pose on social media or a teacher doing a pose and it makes me a bit self conscious. That's where the whole being okay with where I'm at in my practice comes in. What are Your Go-To Yoga Poses When You’re Stressed or In Need of an Energy Boost? Usually when I'm stressed I just go to a class, or jump in the shower in Tadasana. What Do You Listen To When You Practice Yoga? My Integral teacher doesn’t play music, but the other classes I go to, do. When I practice on my own, it's usually Krishna Das, Trevor Hall, Michael Franti. I'll throw in some pop, classic rock, and hip hop in too. I can't think of one piece that sticks out in my mind. But I think I have all the answers in me already, I just need to keep peeling the layers back one by one. What’s Your #1 Piece of Advice for Those Just Starting Their Yoga Practice? Don't let the fear of "what if" get you to quit. It's perfectly okay to sit down on your mat and take a break in class. It's okay to bawl your eyes out—I can't tell you how many times I've cried in class. Yoga isn't just about the poses, it's about digging stuff up and letting it go. It's about learning to be present in everything you do. Yoga isn't just something that is done on a mat, it's a way of life. Dive in without fear, without expectations, and just see where the ride takes you.